How One Family Built America's Public Palaces The National Building Museum in Washington, D.C., has a new exhibit about the soaring tile vaults built by a famous father-son team. The Guastavinos came to this country from Spain in the late 1800s, and left their mark on some of America's most important public spaces. A Washington, D.C., museum wants you to spend some time looking up — to see soaring, vaulted tile ceilings built by a father-son team who left their mark on some of America's most important public spaces. 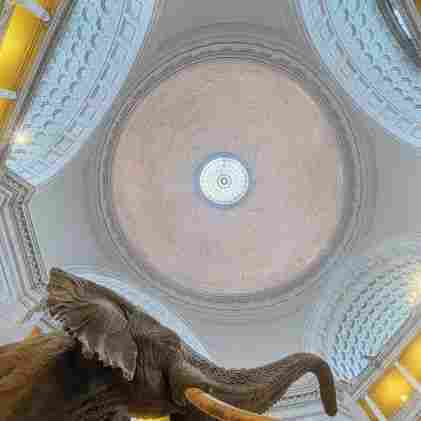 These ceilings grace landmarks that include state capitols, Grand Central Terminal and Carnegie Hall — as well as some more ordinary buildings. One of them is Engine No. 3, a small brick firehouse not far from the U.S. Capitol — where, yes, they still slide down one of those shiny brass poles. It's one of the oldest fire stations in the District of Columbia. 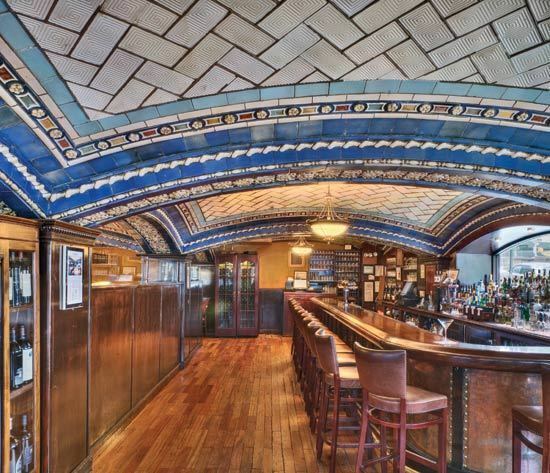 A closeup of the bar in New York City's Vanderbilt Hotel shows the intricate detail of the Guastavino Co.'s elegant ceiling work. Built in 1916, the firehouse has bright red doors, gleaming trucks and a narrow, gently arched ceiling over the entryway. The underside of the arch is lined with white tiles arranged in a ziggy-zaggy herringbone pattern. Firefighter Andre Burns is less than impressed. But that little entryway ceiling has some distinctive touches — the tiles, the pattern — that are being noticed with no little respect at the nearby National Building Museum. There, the exhibition Palaces for the People: Guastavino and America's Great Public Spaces is an impressive display. Photographs, diagrams, drawings and scale models show the beauty and breadth of the work of the Guastavino family — some one-thousand vaults and domes and ceilings in 40 states. 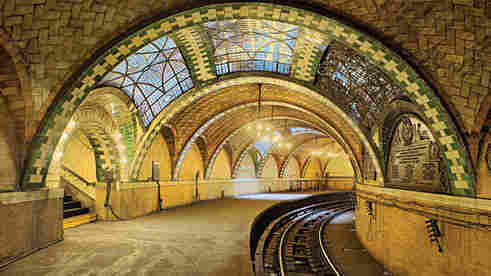 One of the most gorgeous examples of Guastavino skill was for the very first subway line in New York City. MIT professor John Ochsendorf, who curated the Building Museum exhibit, says the City Hall Station featured chandeliers and skylights, and green, tan and cream-colored tile work in intricate patterns — "the Mona Lisa of subway stations," someone once observed. Think You've Seen A Guastavino Vault? Take a picture and add it to NPR's Flickr pool. We'll ask MIT's John Ochsendorf to have a look. "It was called an underground cathedral when it opened in 1904," Ochsendorf says. "The public was afraid to go underground at that time, and so these vaults and this beautiful, decorative, colorful ceiling really helped people feel comfortable in a grand space below the city." The City Hall subway station hasn't been used for 60 years. But Ochsendorf says the vaulting is in good condition — and color photographs make you itch to go underground to see for yourself. What Rafael and Rafael Guastavino did — yes, dad and son had the same first name — was to take Old World building techniques they'd learned in Barcelona in the 1800s and update them for the New World. They were like master masons transported here from the Gothic era, men who knew how to build the correct shapes to make their spaces stand up and stay incredibly durable, strong and long-lasting. Their techniques and their talents were used by leading architects of their day. "Names like Cass Gilbert and Charles McKim, Richard Morris Hunt — they would design the building, their name was on the building, but on their plans and drawings they would write 'Guastavino here,' " Ochsendorf says. "And the Guastavino Co. would come in. They would really do the detailed design of these vaults, and the architects trusted them — because they were masters — to do what was best." Ochsendorf, who teaches architecture and engineering at MIT, says at the peak of its success, the Guastavino Co. had offices in 12 cities across the country. The Guastavino touch also extened to palaces of a more private sort. 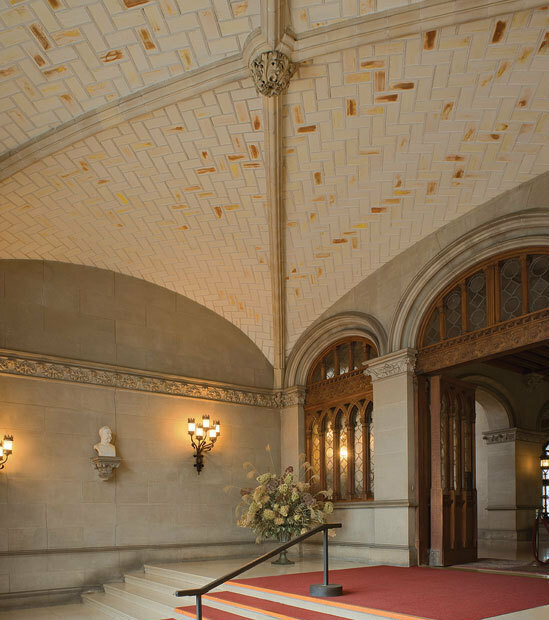 Pictured here is the entrance hall of the famous Biltmore Estate in Asheville, N.C.
"In 1910 alone, I've learned in my research, they were building 100 buildings at once, up and down the East Coast," Ochsendorf says. "Major domes in Philadelphia and New York and Washington and Pittsburgh — it's almost unfathomable today that a construction company would be working on a hundred buildings at once." Clearly the time was ripe. And their timing was impeccable. America was in a building boom. Fires were gutting cities made of wood. When the time came to rebuild, nobody built it better than the Guastavinos. One gallery at the National Building Museum reveals the precision and craftsmanship of their work. It's a cross-section reproduction of the fireproof vaulted ceiling they did in 1889 at the Boston Public Library. It was their first major public building. Thin, thin ceramic tiles, set in cement mortar and layered — five layers, one on top of another like an exotic cake. With no support from below for the soaring ceiling, architect Charles McKim was worried. Would the vault hold? He had the Guastavinos pile more than 500 pounds per square foot on top of their tiled arch to test its strength. "They would load bricks on top of it and see how much it could support," Ochsendorf says. "It held something like 12,000 pounds." Public Spaces, Private Spaces ... Forgotten Spaces? The Guastavinos designed stunning private spaces, too, for Rockefellers, Astors and Vanderbilts. Ochsendorf is still on the prowl for undiscovered Guastavinos. He's inviting everyone to join the hunt — to look for artistically placed thin, colored tile, arranged in vaults, and to let him know what they find. He thinks the work should be better known. "People walk into a building and they say, 'Ah — the windows are Tiffany,'" Ochsendorf says. "We want to get to the point where they say, 'The windows are Tiffany, and the ceilings are Guastavino.' So we're — we're getting there." On a little drive around D.C., we pass one of the Federal City's icons. "There's an underground driveway, and there's an arch," Ochsendorf points out. "And behind that stone arch is a Guastavino vault — as the entrance to the U.S. Supreme Court." "Honestly," he says excitedly, "it's always a discovery." All it takes is a tilt of the head.